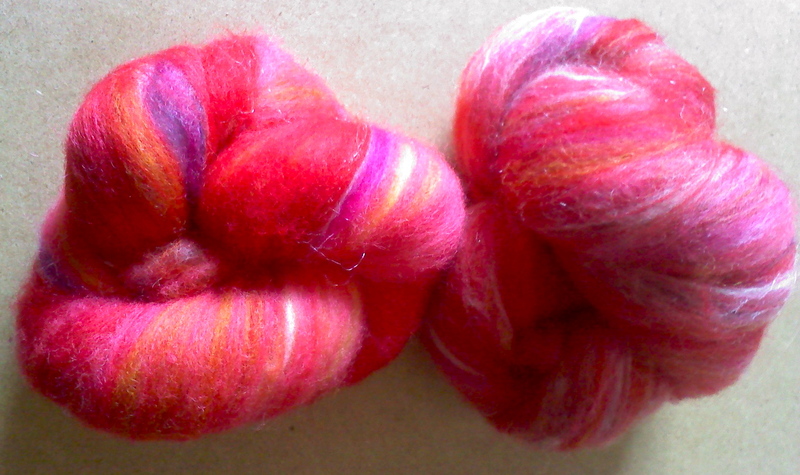 These batts are both made from the same mix of fiber and color, but one was carded twice and the other was carded once. I plan to make a two-ply yarn. This entry was posted in blogging, spinning and tagged batts, fiber arts, fiber arts friday, yarn. Bookmark the permalink. Love those colors! You’ll have to show us pictures of the finished yarn. ooh, pretty! love your plan for the day! Have a fun fiber day! Nice looking bats! Hope you enjoyed your day! I like the color of your fiber. Very pretty! Have a great weekend. This is such a stunning visual. SO wish that I had crafting talent! Those are beautiful! I am venturing into carding yarn with a fleece I bought last year and have just got around to cleaning. Ooh, what kind of fleece is it?